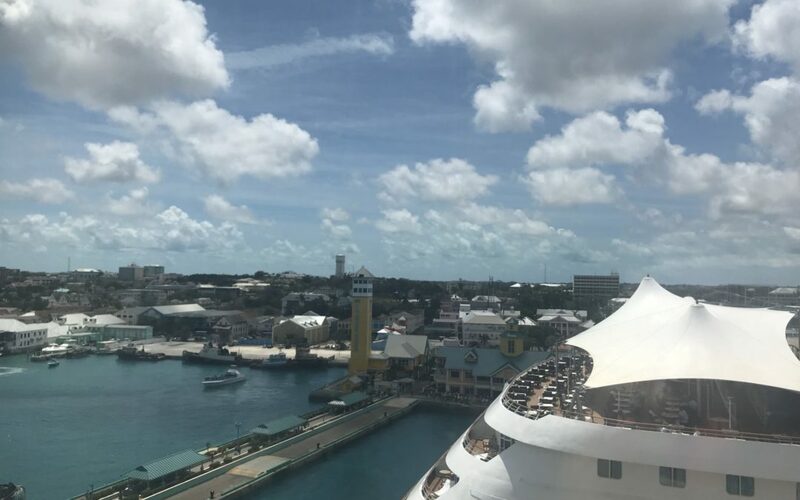 When you decide to take a cruise you know that you will be stopping in seeing several different islands. Some islands appeal to some people and other islands do not. When my family took a three-night Bahamian Disney cruise last spring one of our stops was Nassau Bahamas. This was our first stop after debarking from Port Canaveral Florida. My husband and I have taken our honeymoon nine years ago and went to Nassau Bahamas. Was it alright? Yes, but it did not blow us away. Now with 2 little kids, we knew Nassau was not going to be appealing to us. This is the port that we decided that we were going to just hang on the Disney ship and try to get a lot done on the ship. 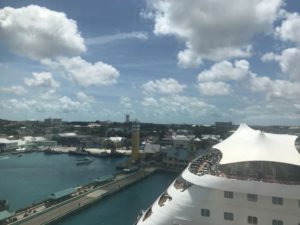 Not only did we choose our Nassau day as the date to stay on the ship, but we also really wanted to get the most out of the Disney dream since we were only on the cruise ship for four days. The amount of money that we were spending, we wanted to make sure we experienced as much as we could. We agreed we did not want to spend too much extra money by booking excursions or heading over to Atlantis for the day which many people do decide to do. 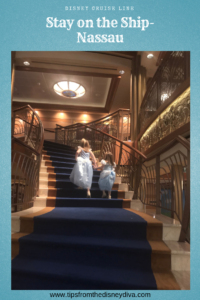 My girls are young, and I know that they would’ve had a much better time staying on the cruise ship for the day then getting off and going to Nassau. Several months before you set sail you are able to make your on board reservations. This is where you can book special events which you need a special ticket to attend. All these special events are free, but you do have to secure your spot because they only allow a certain amount of people at a time. 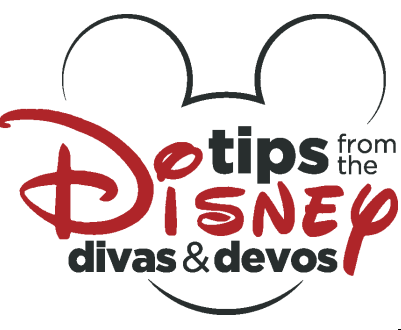 They do have a Disney Junior breakfast which you need to make ahead of time along with a Disney princess meeting, but you also need to book. We chose to do the princess gathering at 10 AM. 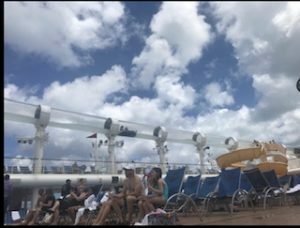 I figured this would be a good day to do so because I’m sure at least half of the ship was probably going to get off the ship to head out to Nassau for the day. 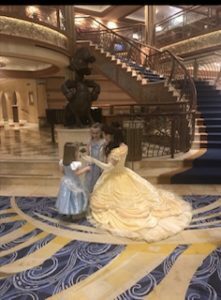 I was able to get my girls dressed in their Cinderella costumes and head down to the special event. The event happened to be running a little behind schedule, so it was a little more crowded than I thought it would be. It was not a big inconvenience, they just told us to come back a little bit after 10 AM since they were running a little behind. This princess gathering is something that I knew my girls would enjoy. I felt like it was a good choice because you were also meeting for different princess. Each princess took their time and took several pictures with you and your family along with chatting with my girls. I thought this experience was very intimate and my girls really enjoyed it. It really made them feel special and that is what it is all about! Check out all of the special events that you can book here! Once our princess gathering was over and all our pictures were done we decided to hit the pool. It was nice because the pool was a little less crowded than I thought it would be. The area was drastically less crowded than a regular day when everyone is on the cruise ship. 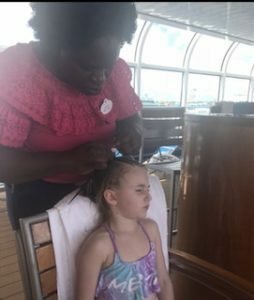 Once we headed down to the pool and grab a few chairs my husband went in the baby pool with my three-year-old and my older daughter who was six at the time wanted to get her hair braided. Luckily there was no wait because the pool deck was not crowded at all and she was able to sit right down and get her hair done. The nice thing with the pool being less crowded is that my girls have a lot more space and were able to have more fun in the pool without having other kids all sandwich in there at one time. As parents it was also a lot easier to watch them in the pool while sitting on the edge when they’re obviously are not that many children will in there at once. As lunchtime rolled around the buffet lines basically were nonexistent so it made finding a seat and eating much easier than a regular afternoon. Once the ship started to get more crowded later in the day we decided to head back to our room, relax, shower and get ready for dinner. My three and six-year olds needed some down time too! Looking back now I do not regret not getting off the ship. I feel like Disney charges the prices that they do because they have so much to offer while you are on the ship. At the end of the day I do feel like I got my money’s worth for that day we chose to stay on the ship and not get off at the island of the Bahamas. We decided to take the same cruise again this coming spring and we are sticking to our same plan. If you realize that your next cruise has a place you may not be interested in seeing, stay on the ship! You know you can not go wrong by doing so. Even if you do not have children and take a Disney Cruise, no problem, grab some drinks and hang by the pools! No one can go wrong by staying on the amazing Disney Cruise ships! If you are interested in a Disney Cruise or Disney Vacation contact All For Dreams Travel Agency to help with all your needs! Happy Planning! 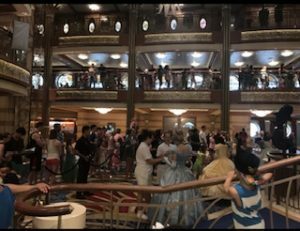 Is a 3 Night Disney Cruise Enough?